Last Friday we were able to squeeze a quick trip in between morning and evening commitments. We’ve had many Fridays like this lately – seems we haven’t had the time we are used to having! 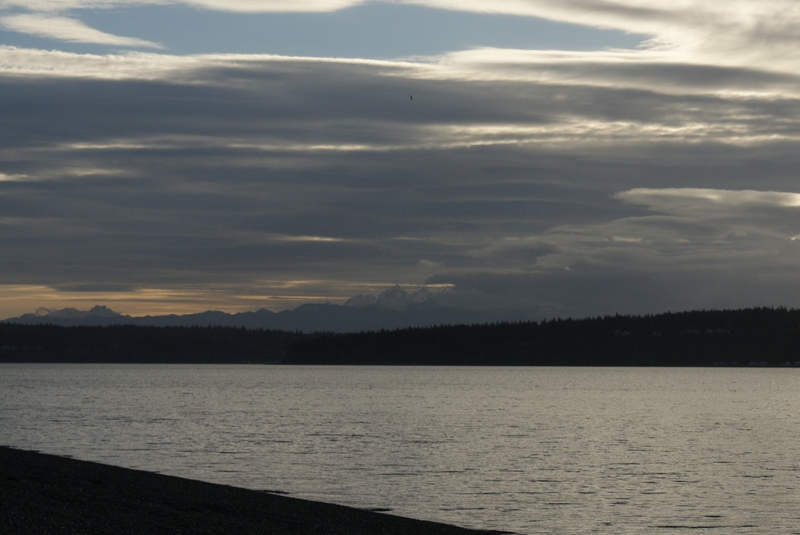 We took a little drive up to Cama Beach State Park on Camano Island. I had never been there before, so it was high time we visited. The hike we took was from Craig Romano’s Winter Hikes of Western Washington Deck: The 50 Best (Mostly) Snow-Free Trails. I had never heard of that hike before; I was happy to see something new in the deck that didn’t appear in other books. It only took us an hour to drive there from north of Seattle. 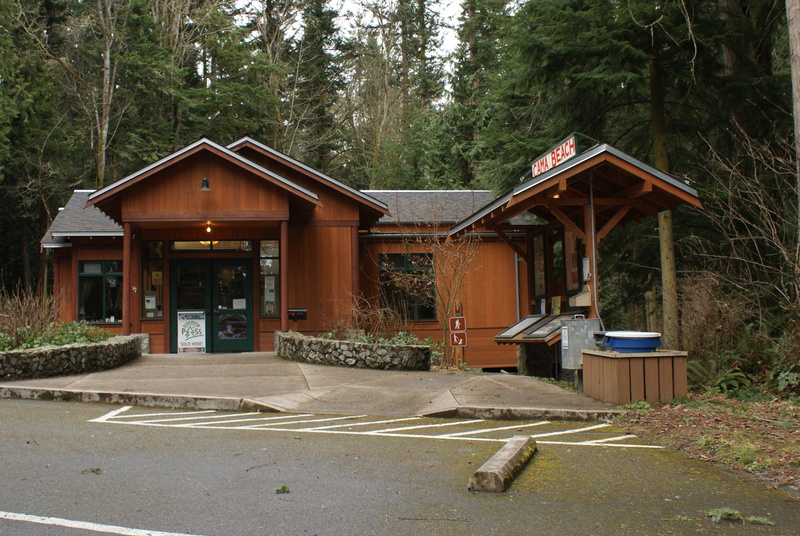 We stopped at the Ranger Station at the entrance to use the bathroom and get a map, since I had left mine at home on the printer. There are a few interpretive items in the station, but it’s mostly a place to get info from the rangers. For the hike we parked out on the road, where the trail intersects the road. There are a few places to pull your car off to the side to park, but be careful not to block the gates on either side. You can also park down in the park, but since we were tight for time, we opted for the shorter hike. The hike from the road is about 0.7 miles one way. 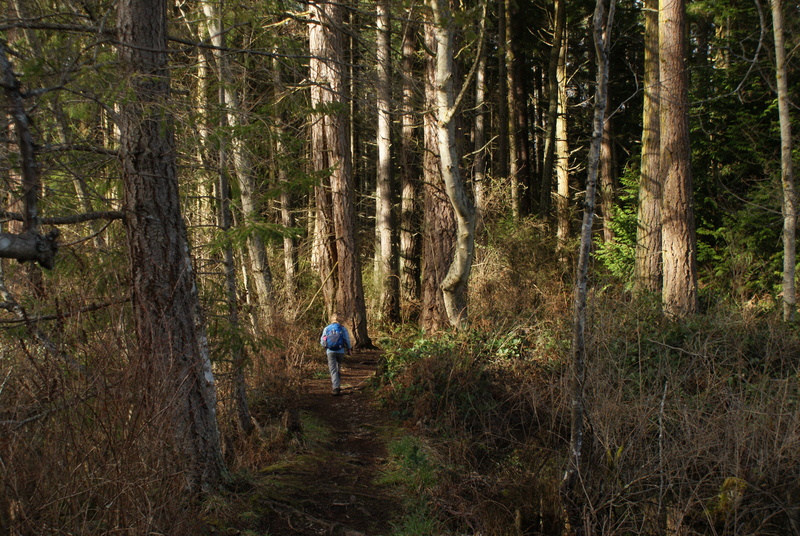 The trail passes through mixed forest, just starting to wake up from winter’s slumber. 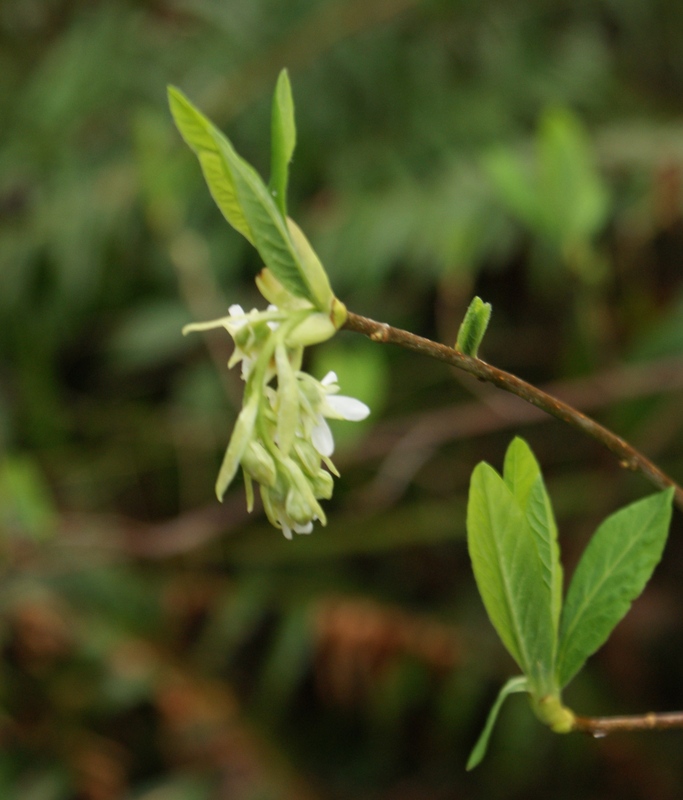 Deciduous shrubs were just beginning to send little leaves out, and the Indian Plum was in full bloom. The weather was mild, and it did feel like spring was on the cusp. 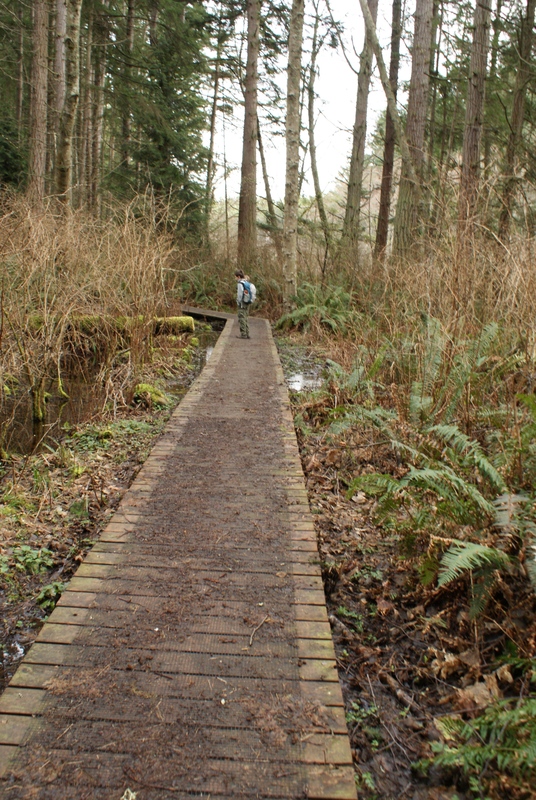 There was a bit of mud on the trail, but most of the really wet parts had a boardwalk covering them, and it wasn’t bad. Birds were singing as we walked; I’ll bet on a warm spring day in a month, they’ll be positively riotous. 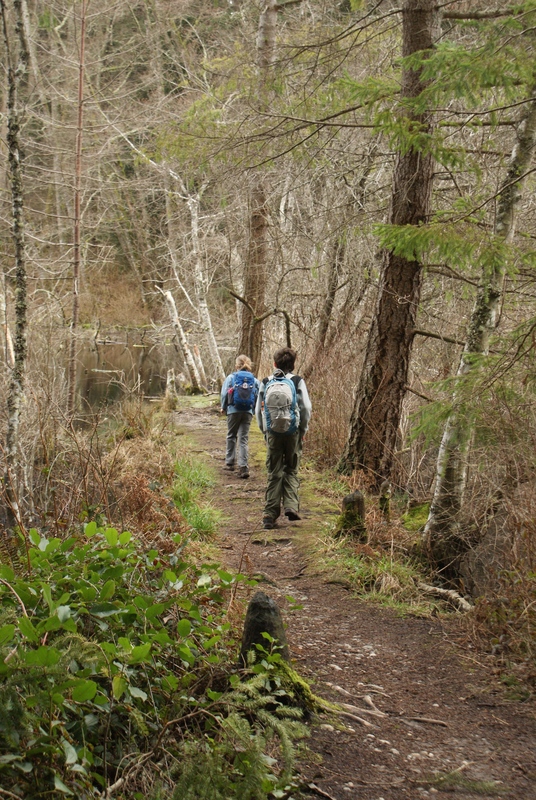 There is a gentle incline on the way to the lake, but it’s a very easy trail suitable for even the youngest hikers. We made good time to the lake, and found a tongue of land poking out into the water. We found a spot to sit there, and had our snacks and cocoa. Gabriel worked on sketching the landscape. We listened to the birds and frogs, and kept an eye on herons on the far side of the lake. We heard juncos, crows, ravens, robins, chickadees, and saw mallards swimming in the open water. We marveled at a pileated woodpecker loudly ka-ka-kakking, and watched a bald eagle soar overhead. It was a peaceful place to sit a spell, and just watch the clouds and sunlight play on the rippling water of the lake. Soon enough, however, it was time to head back, since we wanted to see the beach before we left for home. There is no parking at the beach, but you can walk down from a parking area. I believe in busier times of year, there is also a shuttle you can take down from the upper parking areas. Rustic historical cabins line the waterfront, and they did look like lovely places to rent for a couple of nights. We managed to find a way down to the beach over the seawall, and sat on the cobbles and had another snack. Kingfishers rattled in the distance, song sparrows sang, Barrow’s goldeneyes floated out in the Sound, and a pair of bald eagles kittered occasionally from a tree far away on a bluff. It was warm and calm that afternoon, and we relaxed and gazed out at the mountains and water while we ate. We really wanted to stay longer, but needed to pack up and head south for home before we were ready. But I have a feeling we’ll be back to explore more of this park. 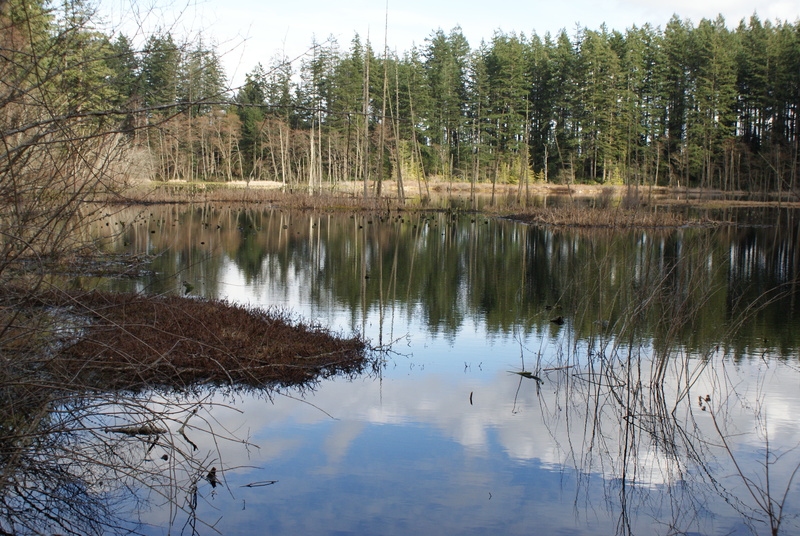 If You Go: Cama Beach State Park has around 15 miles of trails. 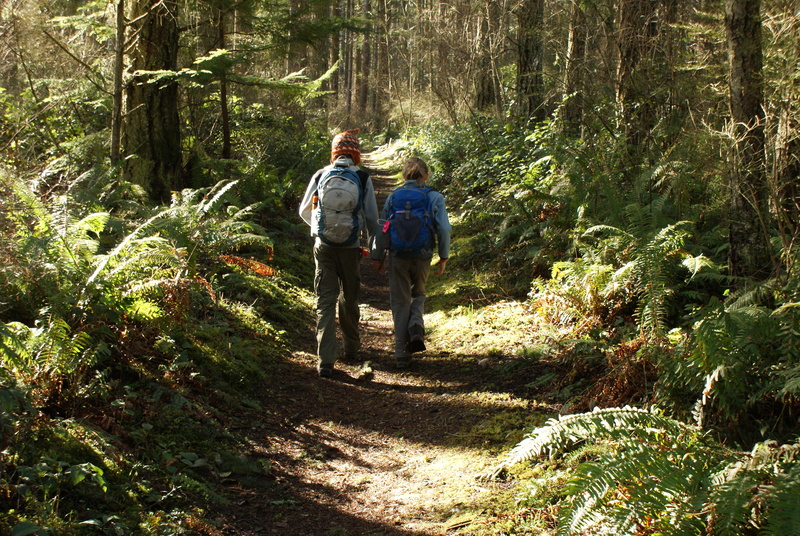 One of these trails connects to nearby Camano Island State Park. You’ll need your Discover Pass to park. 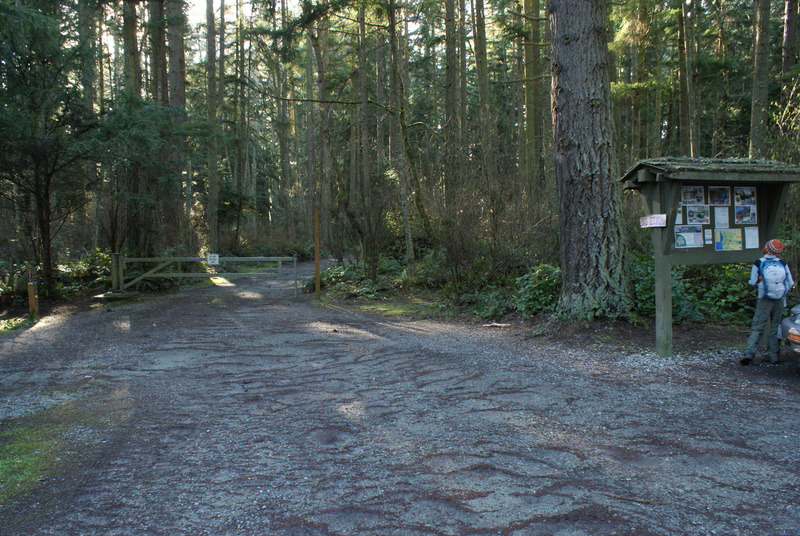 The trail from the road is 0.7 mile one way; there are no restrooms at the trailhead, but there are several inside the park. 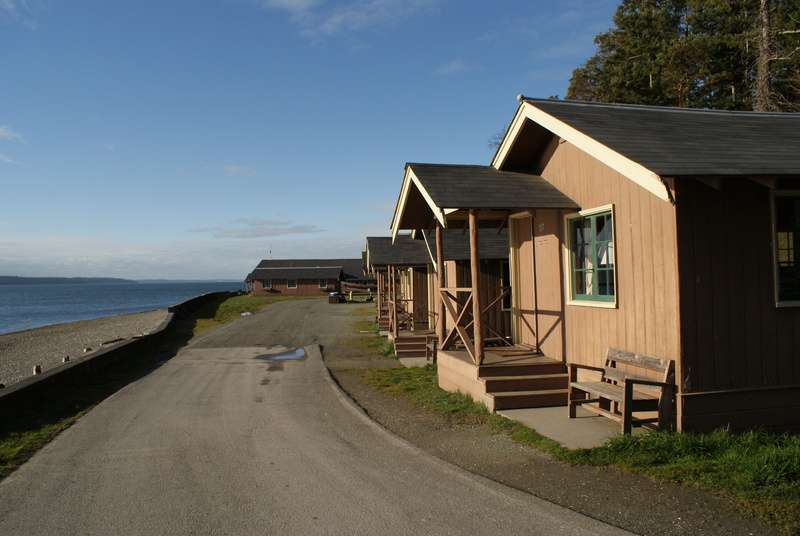 You can find rental information for the cabins at the beach on the park website. 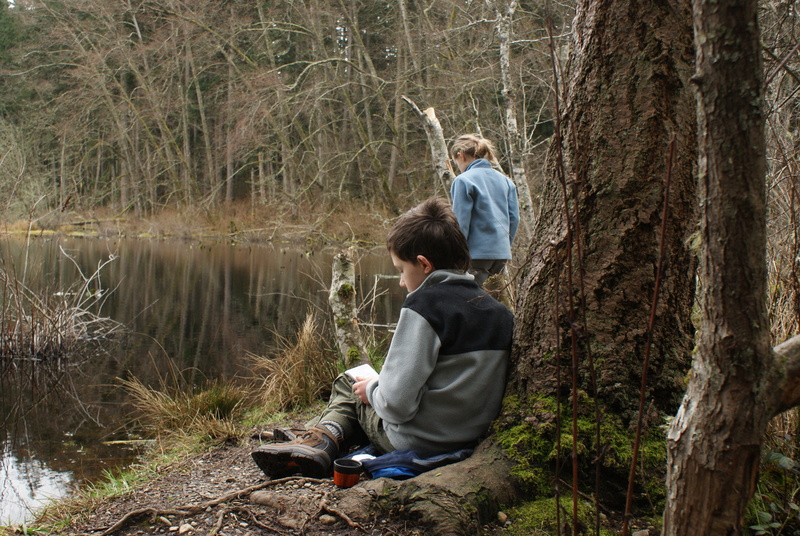 In the summer, they have interpretive programs for children. 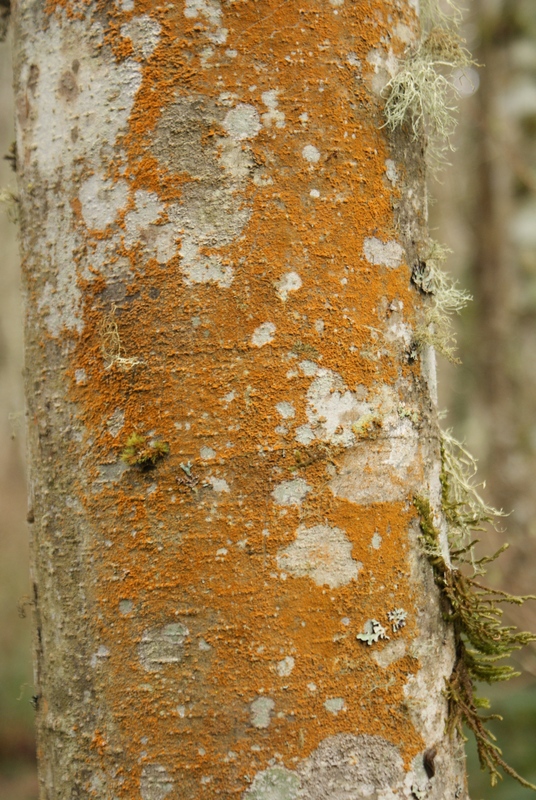 Great report! I would love to get up there with Bergen. Looks like a great spot for him to do some exploring. Your pictures are fabulous! 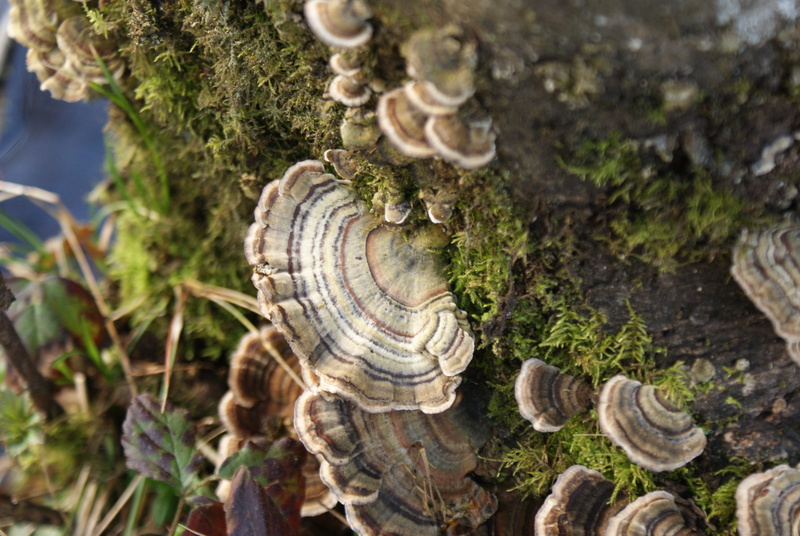 Love the mushroom one–you captured it beautifully.